There are two things that are apparent from these graphs. When you compare this recession to the other recessions in the study, the drop in GDP matches the largest drop in recent history. The job loss is the largest in recent history. This leads me to conclude that based on the economy’s performance so far, the monetary and fiscal policy decisions from 2007 to the present are probably the most ineffective policy decisions in the last sixty years. 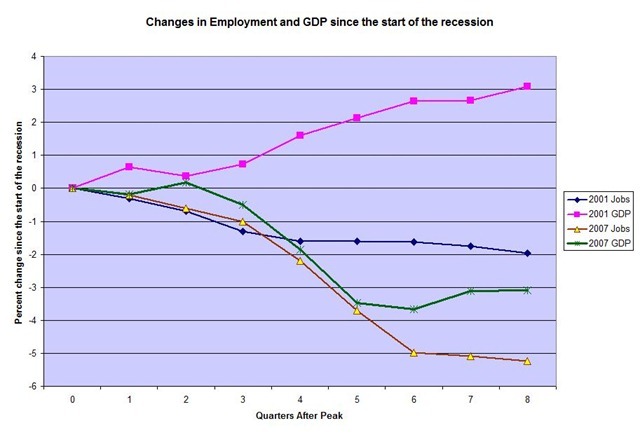 The GDP and employment data says that the 2007 recession has a special relationship with jobs. When I plotted the GDP and employment data on the same graph, I was amazed that the jobs and GDP data were following almost identical paths. Conventional wisdom says jobs and the economy should be related but the 2007 recession has a remarkably close relationship. For kicks I ran a regression analysis on the recent recessions in the study. Surprisingly several recessions demonstrate almost no relationship between jobs and GDP while both the 2001 and 2007 recessions showed a close relationship. Is this a natural result as our economy transforms from a manufacturing economy to a service economy? One of the more interesting economic questions for 2010 is what will the recovery to the 2007 recession look like in 2010 and 2011. Will it look like the 1981 recovery with strong growth in jobs as the the economy took off or will it look like the 2001 recovery in which jobs continued to decline while the economy gradually increased. Based on the close relationship of job and GDP in the last two recessions and the inability of the government to encourage permanent job growth in 2009, my bet is that the recovery in 2010 will look a lot like the 2001 recovery but with a GDP that never fully recovers the ground lost in the recession and a whole lot of fiddling with the employment data to avoid discussing the increasing amount of permanent job losses.